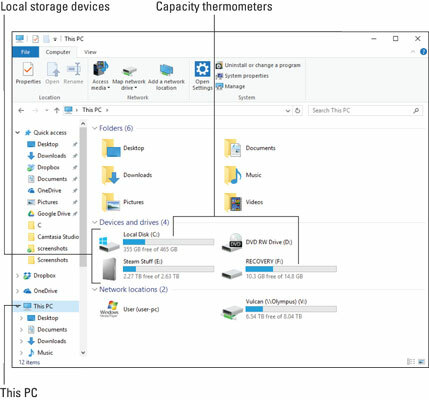 You see an overview of storage available to the computer, similar to what’s illustrated here. At a glance, you can determine the capacity for your PC’s storage. The blue part of the thermometer is used space; the gray part represents available space. When available space gets too low, the thermometer is colored red, which helps you quickly identify hard drives with low capacity. You must deal with this situation if you want to continue to use the drive. For more details on storage, right‐click the drive and choose Properties. You see the storage device’s Properties dialog box. On the General tab, detailed information about the drive’s used and free space is shown, as illustrated here. Storage details for Drive C.
Here, you see that the drive’s total capacity is 465GB. It’s a 500GB drive, but the actual storage capacity of the media is less due to overhead and a given number of bytes taken by the government for tax purposes. The more important figure is Free Space, which as shown here is generous. When free space falls below 10 percent, Windows displays a warning message regarding free capacity. When you see this message, act immediately. Optical discs are always full. They show a red capacity bar in the This PC window. This condition holds true even for writeable discs. The name This PC is awful. In older version of Windows, it was called My Computer, which seems more descriptive. O, Microsoft!